Do you feel confident presenting in court? It is completely understandable to feel nervous, intimidated or unsettled when presenting your evidence in court. 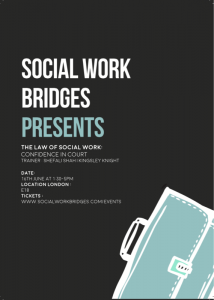 Attending this training which is being presented in collaboration with Social Work Bridges, will provide the perfect opportunity to enhance your skills, overcome challenges and arm yourself with the essential skills that you will need to stand up to scrutiny. As social care professionals, you may need to justify your decisions and professional judgements in proceedings. You could also face cross-examination from other parties legal representatives, as well as questions from the Judges. This comprehensive training will have you ready to present confidently in court. Sign up now for the early bird rate.